Just a short follow-up to yesterday’s post, Owl Dreams. 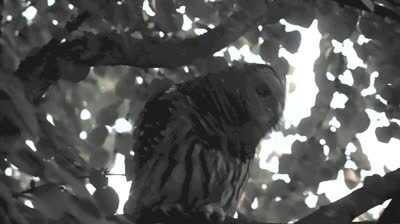 At 8pm last night, the barred owl was still in the tree in front of our house, sleeping peacefully. We took Geordie for his evening walk and he was still there when we got back, but his behaviour was changing. There was much more head movement and he was clearly shifting into night hunting mode. I took a little video to try and capture it. The quality isn’t great, but you can see what I mean. If you’re looking at this in an email, the video won’t show. You will need to click on the blog title at the top of the email and that will take you to the actual blog, where the video and all the photos will be found, and the blog layout will be much better. Just after I took the video, the owl flew off the tree, landed briefly on our car and then on to a plum tree across the street. And then he was off and away like a ghost in the night. He had been in front of our house for a full twelve hours. I can still hardly believe that yesterday happened!